Fixing an amplifier that has no sound can be a challenging problem, even for an experienced musician or amplifier technician, as there are many things that can cause the problem. However, there are a few common causes that are generally responsible for this particularly irksome problem, and most of them can be done by almost anyone with little technical knowledge. However, it is imperative that you are careful when troubleshooting an amplifier, and always make sure it is off when touching any internal parts. Check to make sure the speaker cone or cones are properly connected and the connections are not loose. This is often the cause of intermittent sound in an amplifier, particularly if you are a working or traveling musician and you move your amplifier around a lot. Check the speaker connections. Make sure the wiring connected to the speakers is firmly connected and is not loose. On some amplifiers, you may have to remove the chassis with a screwdriver to do this. Use a continuity tester to check the continuity of the cabling that you are using to connect your guitar to your amplifier. While this is not a problem directly associated with the amplifier itself, it is a very common cause of intermittent sound. A continuity tester can be purchased in most music and electronics stores for little money, and it is a great tool for a guitarist to have in his arsenal. Make sure there is no oxidation on the input or output jacks of the amplifier. Replace any jacks with oxidation with new, clean jacks. Remove the chassis and cover with a screwdriver, unscrew the jack and put in the new one. Spare input and output jacks can be ordered from most music stores. Swap your vacuum tubes one at a time if you are using a tube amp. While this is a somewhat long procedure, an overheating tube is a very common reason for a guitar amp to have no sound or intermittent sound. Turn off your amp to swap out tubes. Remove the tube and insert a new one. You may be able to tell if a tube is extremely hot by simply putting your hand near it and repeating the process with the rest of the tubes, although this is shoddy at best. Check for any loose solder joints on the inside of the amplifier. When an amplifier gets particularly hot after a long period of use, solder joints can start to open up and disconnect themselves. Check solder joints by removing the chassis while the amplifier is still warm. Always be careful when troubleshooting an amplifier. Many parts of the amplifier store electricity for some time, and an incorrect troubleshooting procedure can be very dangerous. 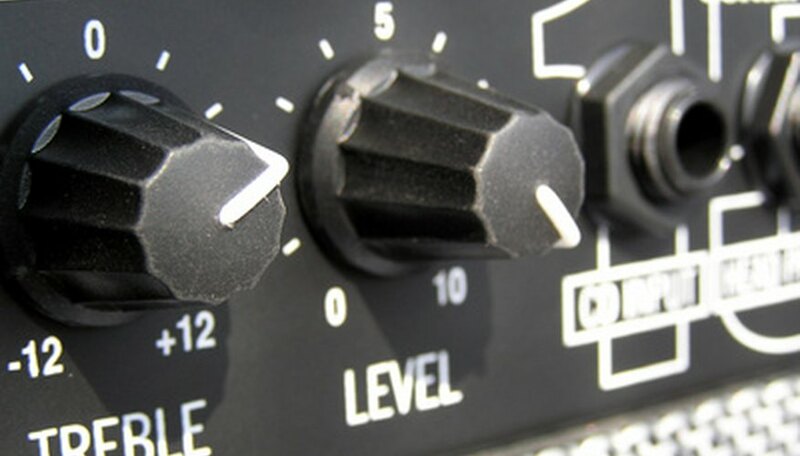 If you are unsure how to deal with an amplifier problem, it is best to take it to a professional technician for advice.